Guardian News and Media has recruited New York Times journalist Aron Pilhofer to fill new the job of executive editor of digital. Pilhofer, who is also editor of interactive news at the New York Times, will work across the Guardian's editorial teams to develop and execute new and innovative digital journalism initiatives and tools to help grow global audiences and deepen reader engagement. His new role will see him helping drive the Guardian's digital transformation, working in concert with a global team of journalists and developers. He will start in the Guardian's US newsroom in June and will move to the Guardian's offices in London over the summer. At The New York Times, Pilhofer was responsible for helping develop and execute the newsroom's approach to technology, new product, analytics and social media. As the editor of Interactive News, Pilhofer led a 40-person team he founded and built in 2007, embedded within the newsroom, to create new forms of journalism by blending social media, analytics and technology. "When we began talking in March, it was immediately apparent that Aron would bring the right combination of passion, ambition and skill to the Guardian," said Janine Gibson. "He is a terrifically talented and visionary editor who clearly understands the future of digital journalism and we're delighted he is joining our team." "Aron Pilhofer is a pioneer of digital storytelling and inspires so many digital newsrooms in their search for the journalism of the future", said Wolfgang Blau, the Guardian's Director of Digital Strategy. "We are incredibly excited to have Aron join the Guardian during this critical phase of entering into a more collaborative relationship with our readers around the world." "The Guardian has proven to be among the most exciting places to do quality, ambitious digital journalism on a global stage. I'm thrilled to be joining the team at such a fantastic time," said Pilhofer. In April, the Guardian announced that it had broken through the 100 million monthly unique browser barrier for the first time, according to the latest ABC digital figures. 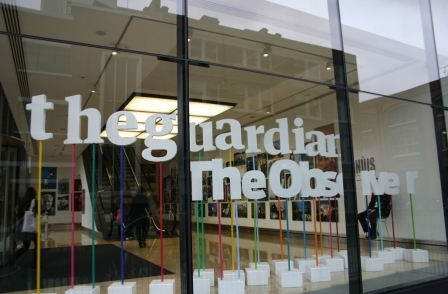 Since launching its US and Australia digital editions in 2011 and 2013 respectively, traffic from outside of the UK now represents over two-thirds of the Guardian's total digital audience. Guardian US won the 2014 Pulitzer Prize for Public Service for its reporting of the NSA disclosures made by Edward Snowden. In 2014, the Guardian was named newspaper and website of the year at the Society of Editors UK Press Awards.